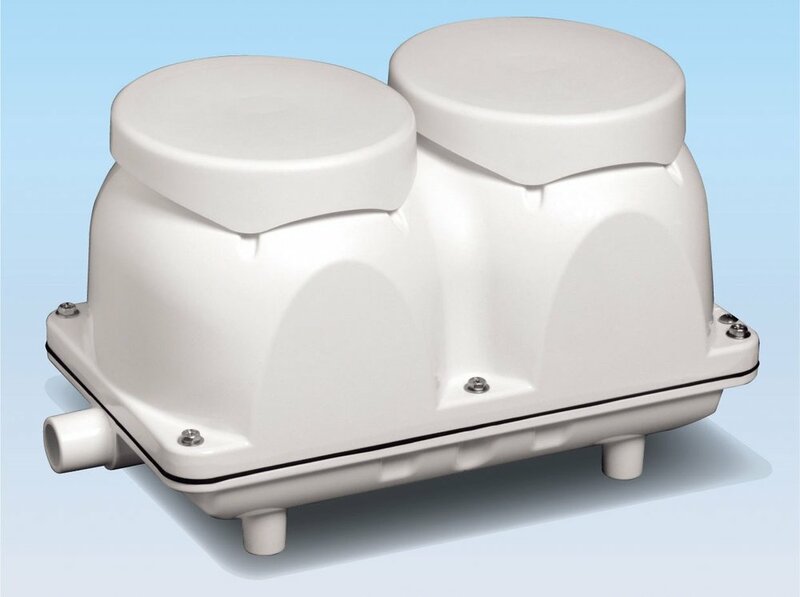 A revolutionary improvement in septic system design, installation and repair. A Revolutionary improvement in septic tank design. 127” x 62.2" x 54.7"
176” x 62" x 55"
Length 64.9” x 61.7" x 54.6"
Faster, easier and more efficient. Installed quickly and safely without the need for additional machinery. Drain fields installed without the need for gravel. Less mess, faster installation. 5 Year Manufacturers warranty on tanks. 25% less space than a conventional septic system. 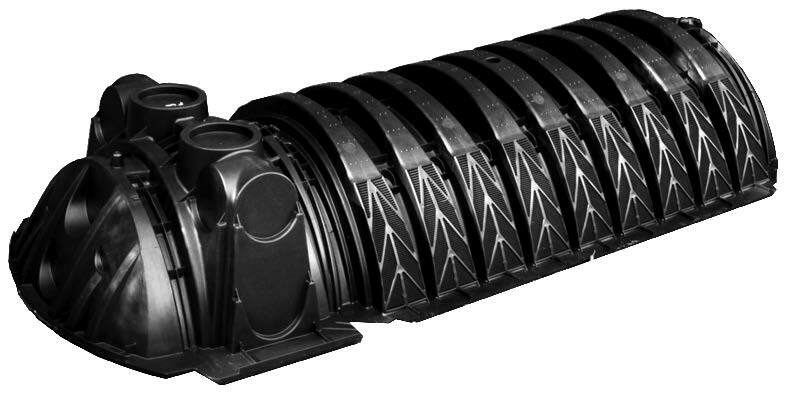 Chamber drain field systems are engineered for strength and performance, they have greater design flexibility including a smaller footprint as compared with stone and pipe, and are made from recycled materials. Chamber drain field systems are engineered for strength and performance, they have greater design flexibility including a smaller footprint as compared with stone and pipe, and are made from recycled materials. The Quick4 Plus Standard Chamber offers maximum strength through its two center structural columns. This chamber can be installed in a 36-inch-wide trench. Like the original line of Quick4 chambers, it offers advanced contouring capability with its Contour Swivel Connection™ which permits turns up to 15-degrees, right or left. 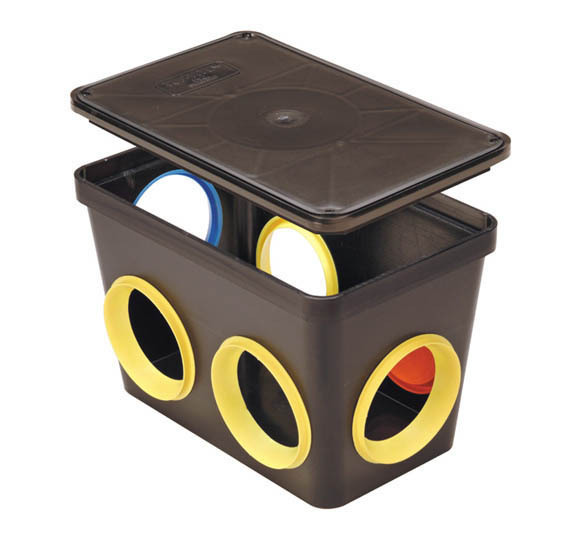 It is also available in four-foot lengths to provide optimal installation flexibility. The Quick4 Plus Standard Low Profile (LP) offers maximum strength through its four center structural columns. This chamber can be installed in a 36-inch-wide trench. It is shorter in height than Infiltrator’s other Standard model chambers, allowing for shallower installation. Quick4+ LP offers advanced contouring capability with its Contour Swivel Connection™, which permits turns up to 15°, right or left. We are focused on highly efficient wastewater technologies that use less energy, reduce life-cycle costs and provide environmental benefits to users and the communities in which they operate. 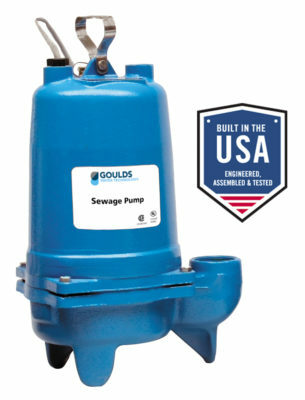 Together with Goulds, we meet critical wastewater challenges head-on by creating a broad portfolio of products, applications and services to create efficient systems and sustainable solutions. Impeller: Cast iron, semi-open, non-clog with pump-out vanes for mechanical seal protection. 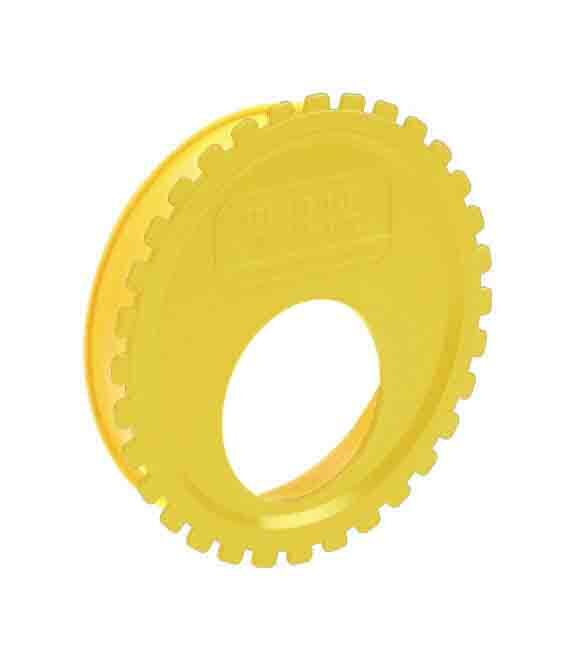 Tuf-Tite produced its first product in 1984. Years of polymer formulation experience and field testing have led to the full line of drainage and septic products. Tuf-Tite is an American owned and operated company and it's polymer products are manufactured in Lake Zurich, Illinois. Polylok, Inc. is an international supplier of plastic injection molded products for the precast concrete and onsite wastewater industries. They design, manufacture, and ship all of their products from their Wallingford, Connecticut headquarters. Shoaf Precast is a third generation family business, founded in 1966, located in Lexington, NC. Shoaf manufactures our quality precast concrete products. Their commitment to quality, service and customer satisfaction is what sets them apart from the competition. Marlin offers 240 gallon to 3,500 gallon non-traffic rated tanks for the onsite, sanitary and sewer industry. From standard residential septic tanks to special design pretreatment tanks, Marlin has a solution to meet your needs. 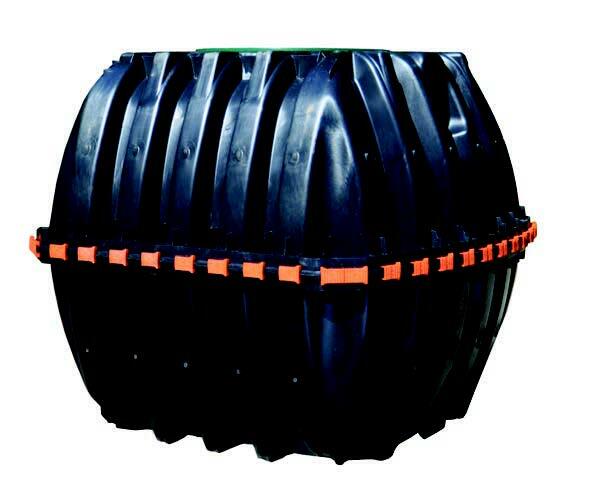 Non-traffic rated tanks are designed for residential and light duty commercial applications where vehicular traffic patterns do not exist and for a maximum coverage depth of three feet. 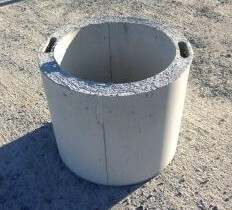 Often it is necessary to install a precast concrete grease interceptor or septic tank in a vehicular traffic area. We have a full line of traffic rated products including a 6,000-20,000 gallon Septic, Pump and Grease Tanks designed and approved to handle H-20 and HS-20 loading! Each tank is reinforced with grade 60 domestic rebar, which is cut, bent and placed per engineering specifications to ensure a true traffic design. Marlin offers different size concrete risers available in either round or square shaped depending on your preference and/or need. We have H/20 (traffic rated) or non-traffic concrete risers in which are edged and finished to create an appeasing curbside like finish. 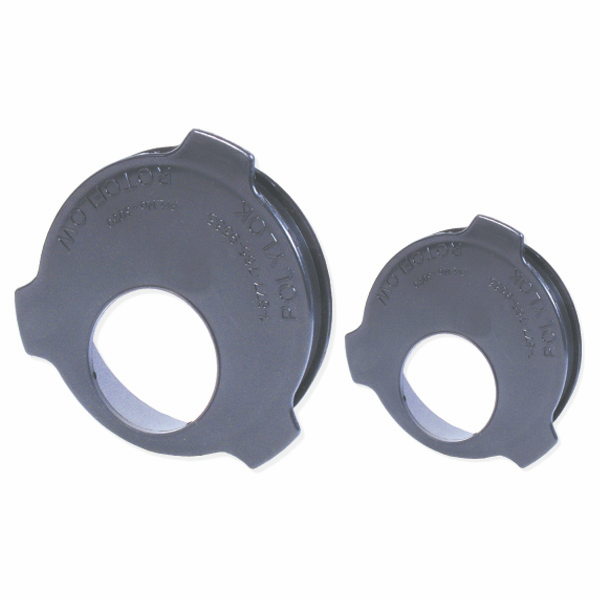 We also offer EZset and Polylok plastic round risers (non-traffic). Risers are very beneficial as they allow for easy location, inspection and pumping of your tank. The Roth MultiTank can be used for water cistern, pump, holding, rainwater or septic tank. 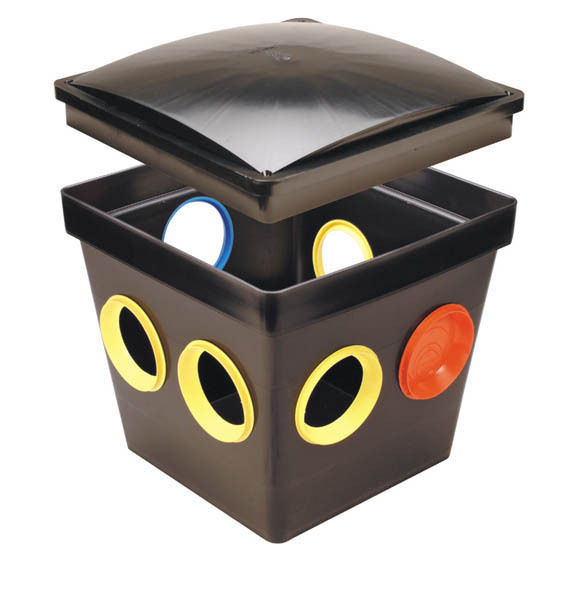 This is possible due to its special construction of an inner layer of FDA approved virgin HDPE, two inside layers of PE for improved stability, plus one outer layer of black and UV-stabilized PE. Not only is it special in terms of its construction, it also has an industry leading warranty: lifetime corrosion protection and 5 years of labor insurance coverage. Norwalk Wastewater Equipment Company (Norweco) is a manufacturer of water and wastewater treatment products, systems and chemicals. They specialize in small-flow treatment applications, ranging from municipal treatment systems for small towns and villages, all the way down to systems for the individual family home. Norweco products are designed to provide a high level of treatment in the most efficient, cost-effective manner. With headquarters in Nagoya, Japan, Fuji Clean Company is the leading onsite domestic wastewater treatment in the world. Founded in 1961, Fuji Clean Co. now has about 500 employees, manufactures between 40,000 and 50,000 systems annually and has over two million systems installed and operating in Japan. The company has recently begun to expand worldwide and now has subsidiaries and dealers in Australia, Europe, Vietnam and the United States. Since 1981, Orenco Systems — headquartered in Oregon, USA — has designed and sold affordable, sustainable wastewater treatment products for properties not served by conventional sewers. Our award-winning technologies are cited in wastewater texts and installed all over the world. They include fiberglass septic tanks and septic systems, advanced treatment systems, effluent sewers, and control panels. Since the 1970's the founders of E-Z Treat corp. have been designing and manufacturing efficient and affordable onsite re-circulating sand filter, wastewater treatment systems. We work closely with engineers, installers, local regulatory agencies and end users to develop the right wastewater treatment solution for your specific needs. Bio-Microbics was founded to commercialize residential wastewater treatment systems. Bio-Microbics initially began by manufacturing its popular SinglehomeFAST® treatment system, and has since expanded into highly adaptable small flows and distributed systems for commercial applications, small communities and stormwater treatment systems – which have become a growing success. The Clearstream Wastewater Treatment System is a highly efficient "extended aeration" sewage treatment plant. This system, through aeration and clarification, provides a proper environment for aerobic bacteria and other micro-organisms that convert the incoming sewage into clear, odorless, and organically stable water. Enhancing the natural treatment process. The Aquaworx Remediator rejuvenates most failing septic systems with minimal landscape disruption. 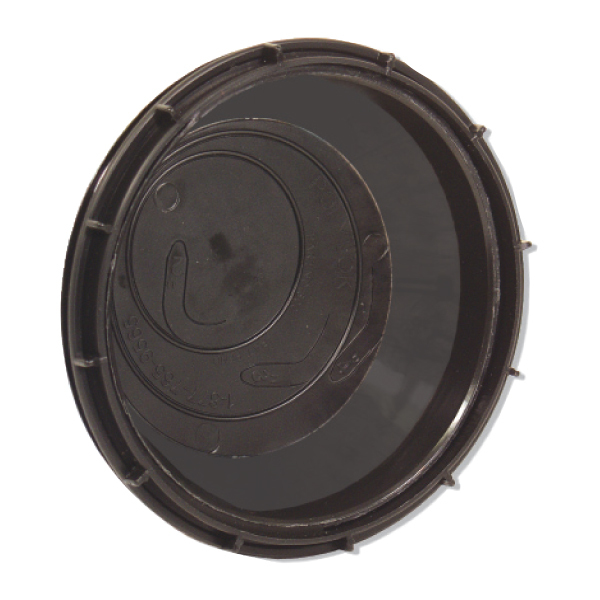 This unique solution is inserted into the existing septic tank and can reverse the biological clogging process causing the failure in as little as two weeks. The Aquaworx Remediator can rejuvenate most types of wastewater drainfield designs and is a simple, permanent solution that is inexpensive to install, operate and maintain. The Aquaworx Remediator is an airlift column. Inside its structure, bacteria are introduced into the center column where they combine with the oxygen enriched effluent. The cuspated plastic wrapped around the bottom outside and within the Aquaworx Remediator provides a substantial surface area for the colonization of bacteria. Aerobic bacteria thrive within the tank and stimulate the reversal of the drainfield clogging process as they work to consume the organic matter. The end result is predictable, reliable drainfield remediation. The Aquaworx Remediator is not an Advanced Treatment Unit. The Aquaworx Remediator system works by simply enhancing the natural treatment process in which oxygen and bacteria work together to maintain a clog-free septic system. Under normal operation, a septic system builds up a biological layer (biomat) that restricts the soil’s ability to absorb water. Over time, the biomat may become overly restrictive ultimately causing a system malfunction. Once installed in the septic tank, the Aquaworx Remediator uses a Fine Bubble Air Diffuser to introduce oxygen into the Bacterial Growth Media column so the bacteria can begin to thrive and consume organic matter. The aerobic bacteria combine with the oxygen rich effluent in the tank and then move to the drainfield to reduce the clogging layer and restore infiltration into the soil. It’s simple, reliable and natural. Along with the addition of oxygen, the Aquaworx Remediator comes supplied with a Bacterial Catalyst that is inserted into the center of the Aquaworx Remediator to kick-off the remediation process. The Bacterial Catalyst is a proprietary blend of facultative aerobic bacteria that accelerate the consumption of clogging matter. The bacteria within the oxygen-rich wastewater works to consume the waste materials suspended in the tank and reduce biomat in the drainfield. Under normal conditions a homeowner will begin to see improvement in their septic system within the first two weeks. If the Aquaworx Remediator is maintained regularly, it will continue to operate as a permanent solution. High-performance, dependable, compact, efficient and cost effective. The World's Leading Manufacturer of Onsite Wastewater Treatment Systems. Fuji Clean Company is the leading onsite domestic wastewater treatment system in the world. Founded in 1961, Fuji Clean Co. now has about 500 employees, manufactures between 40,000 and 50,000 systems annually and has over two million systems installed and operating across the globe. World’s #1 treatment system with standard and nutrient reduction models to treat flows up to 8 bedrooms. High performance, highest cost-value systems to treat flows from 1,000 gpd to 100,000 gpd. Best-in-class air blowers from 1.4 cfm(40 L/min) to 7.0 cfm (200 L/min).